Ester Heesch’s fine, straight, blonde hair is styled in a simple updo with loose..
Ester Heesch’s fine, straight, blonde hair is styled in a simple updo with loose tendrils on each side of the face. 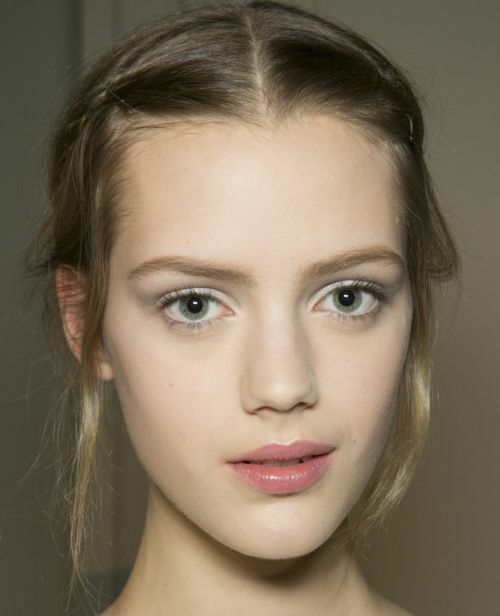 Ester wore this hairdo in Valentino’s spring runway show in 2013. Ordinary buns can a bore, we know. That’s why from time to time a tweaked vers.. Ordinary buns can a bore, we know. That’s why from time to time a tweaked version is necessary such as Ester Heesch’s multi-spiraled version. Score the ‘do by creating a sleek base with mousse. Part hair to one side, and then do a low-slung ponytail. Apply some gel at the ends to make them more polished. Do a few sections (1/2 inch) of the loose end of the pony and twist each tightly until they bend naturally. Pin each to the base of the ponytail making sure that no stray hairs are seen. Hairspray’s optional.